Translated by Sandra Smith, with an introduction by Patrick Marnham. In 1929, 26-year-old Irene Nemirovsky shot to fame in France with the publication of her second novel David Golder. At the time, only the most prescient would have predicted the events that led to her extraordinary final novel Suite Francaise and her death at Auschwitz. Yet the clues are there in this astonishingly mature story of an elderly Jewish businessman who has sold his soul. Golder is a superb creation. Born into poverty on the Black Sea, he has clawed his way to fabulous wealth by speculating on gold and oil. When the novel opens, he is at work in his magnificent Parisian apartment while his wife and beloved daughter, Joy, spend his money at their villa in Biarritz. But Golder's security is fragile. For years he has defended his business interests from cut-throat competitors. Now his health is beginning to show the strain. As his body betrays him, so too do his wife and child, leaving him to decide which to pursue: revenge or altruism? 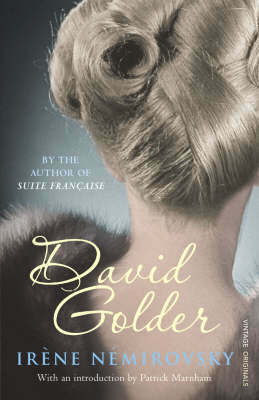 Available for the first time since 1930, David Golder is a page-turningly chilling and brilliant portrait of the frenzied capitalism of the 1920s and a universal parable about the mirage of wealth.